Relative sea level rise at Kerguelen Island over the last 55 years has been investigated using a combination of historical and recent tide gauge data. The best estimate of relative sea level trend from data sets spanning 38 years is estimated to be 1.1±0.7 mm year−1. We have tried to quantify the error budget due to some of the possible sources of uncertainty. As expected, the main source of uncertainty comes from oceanic interannual variability, preventing an accurate estimate of sea level trend over short record lengths. However, our values are reasonably consistent with other reported southern hemisphere sea level trends for similar time periods. 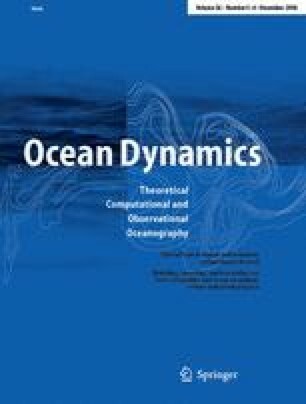 This paper is dedicated to Christian Le Provost, who was instrumental in building the Réseau d'Observation Subantarctique et Antarctique du niveau de la MEr tide gauge network in the framework of the World Ocean Circulation Experiment and Global Sea Level Observing System programs. Thanks to the three referees for their useful and necessary comments and to Richard Coleman for English correction and useful discussion. This study is the result of the work of a large number of people who stayed at Port-aux-Français over the last 50 years. Some of them are cited in the references. The ROSAME network is maintained with the active participation of the staff of the Division Technique of INSU, especially M. Calzas and A. Guillot, who also have been helping us develop the ROSAME network since 1997. This work would not have been possible without the tide pole readings operated by the technical volunteers who wintered at Kerguelen between 2003 and 2005: Julie, V. Dutreuil, P. Caillol, C. Lacaze and J. Petit. Thanks to H. Gouge (TAAF) and A. Lamalle (IPEV) for important information on the history of the Kerguelen tidal measurements. Finally, thanks to Mr. and Mrs. Delépine for valuable information on the 1970s period and for exciting discussions.